Flow may be very high at some points throughout the year, especially during peak run-off periods or after exceptionally rainy periods, so measuring flow multiple times throughout the planning period is vital. Designing a hydropower system to handle peak flows that only occur just a few days a year is unlikely to be cost-effective. Sizing a system that uses flows that are available for a majority of the water season is more cost-effective. The variance in annual flow can be depicted graphically through a flow duration curve, such as Figure 26. Use of a flow duration curve can allow for more accurate small hydro planning by considering maximum and minimum flows and observing trends in consecutive yearly data. 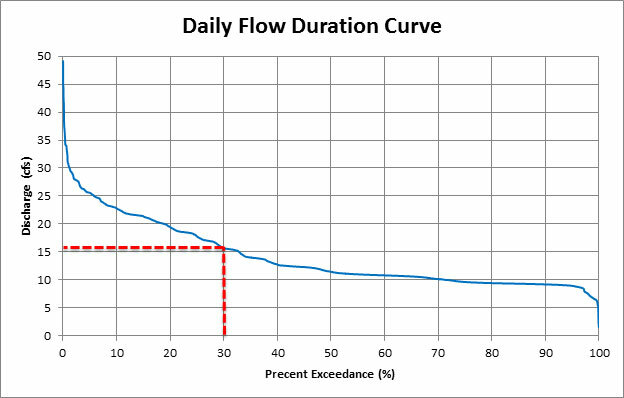 Flow duration curves graphically depict the relationship between channel flow and the percentage of time that specific flow is exceeded. The design flow is the flow at which the turbine operates most efficiently and is the maximum flow rate the hydro system should operate at for an extended period of time. When looking at the flow duration curve, an initial estimate of the design flow for a small hydro system will typically be the flow associated with an exceedance value of 30 percent. For the example in Figure 28, the design flow at 30 percent exceedance would be approximately 15 cubic feet per second (cfs). This is a general rule-of-thumb and can vary depending on the shape of the flow duration curve. To size the system more accurately, each system will have to be analyzed individually and the costs and benefits compared among potential turbines. Generally, the design flow can be exceeded by approximately 10 percent; however, running the turbine at this higher flow rate should not be a frequent occurrence as turbine efficiency will decrease and excessive wear or damage to the turbine or components may result. There are two accurate methods for measuring head – direct distance measurement and water pressure. The most accurate direct distance measurement is a topographic survey conducted by a professional land surveyor. A similar method is to use a surveyor’s transit, a contractor’s level on a tripod, or a level taped to a straight board to measure gross head. A surveyor’s rod or a pole with graduated measurements is also required (measuring tape affixed to a 20-foot section of PVC pipe works well). Direct measurement requires an assistant. Make a series of vertical measurements using the transit level and the vertical measuring pole. Make sure each transit setup is exactly level, and ensure the measuring pole is vertical. Keep detailed notes at each step and then add up the series of measurements (A, B, C, D, etc.) to find the gross head. This method may not be practical if the pipeline is long. As an alternative, pressure readings across a pressure reducing valve (PRV), say on a municipal pipeline, can be used to determine the net head available for hydropower. If the PRV is on a penstock that will supply the turbine and the upstream and downstream pressure readings are recorded at the design flow in the pipeline, then the difference between the two pressure readings can be correlated to an accurate measurement of the net head.